As high-quality brands like Bosch continue to adopt the option, the appeal of black stainless just keeps growing. For anyone looking for a new kitchen set, Bosch’s line of black stainless appliances really is a no brainer. The sleek, timeless design of Bosch appliances and the contemporary cool of black stainless combine to create a kitchen that’s as elegant as it is efficient. But if you still aren’t sure, check out these five reasons why your next kitchen redo should feature a black stainless set by Bosch. If you’ve ever owned stainless steel appliances, you know what a hassle it can be to keep them clean. Streaks, scratches, and sticky fingers can take a real toll on your beautiful stainless steel, quickly dulling its natural shine. With black stainless steel appliances from Bosch, those fears will be a thing of the past. These appliances aren’t made with a simple foil coating, they’re made of a special material that resists scratches and fingerprint marks to keep your kitchen looking better than ever. A Bosch black stainless appliance set goes well with everything, and we mean EVERYTHING. White walls? Check. Bold cabinet colours? Check. Contemporary kitchen? Definitely. Rustic inspired style? A great way to add a modern touch! Black stainless really can do it all, and it’s a great way to pull together a kitchen, no matter the style. You know what they say—black is the new black! The black stainless appliance trend started in Europe a few years back, and it’s been slowly making its way west ever since. Not only do black appliances embody a contemporary cool that American kitchens are always striving for, they have a certain unbeatable European elegance about them that’s impossible to resist. Plus, even though the trend is gaining popularity fast, we’re still in the early years of the black stainless steel-explosion. That means you’ll be way ahead of the curve when the trend really makes it big time! In addition to being works of art in their own right, black stainless appliances can also be arranged to take a supporting role to your favourite accent pieces. Like a black velvet jewelry box, black stainless makes the gems in your kitchen pop. Whether that means your painstakingly painted cabinets, a one-of-a-kind antique table, or your kids’ artistic masterpieces, black stainless provides a perfect backdrop for the most important things in your home. You’d be getting a full set of Bosch appliances! Need we say more? Well loved by home cooks and professional chefs (like Chef Curtis Stone of Top Chef and Take Home Chef fame), Bosch has made a name for itself as a brand that’s as excellent as it is elegant. 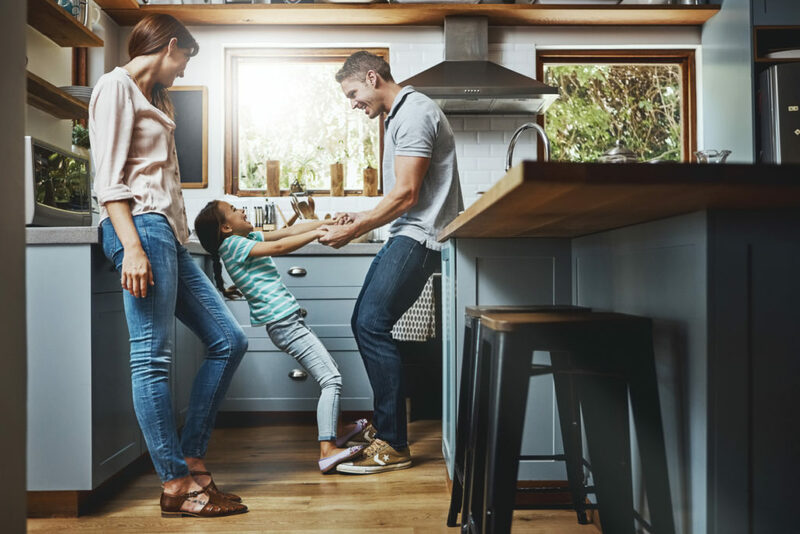 A Bosch kitchen really is a pro-kitchen, and all style aside, if you get a black stainless appliance set from Bosch, you know you’ll be investing in a reliable kitchen set that will serve your family well years to come. So don’t wait! 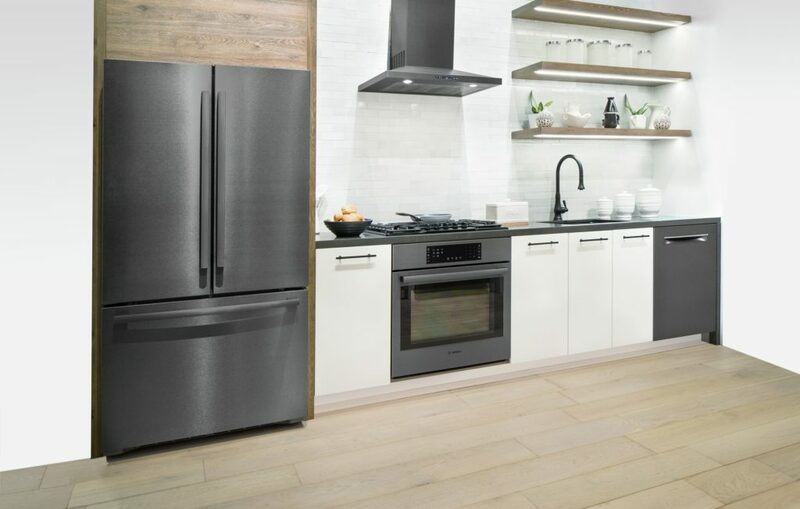 Get started on that kitchen reno and take your style to the next level with black stainless steel appliances from Bosch. Your future kitchen awaits you!